Galani, is also known as fried ribbons, bow ties or angel wings in the U.S. 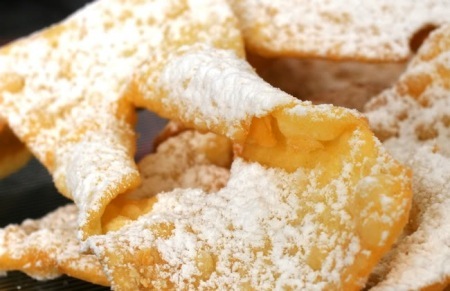 The ribbons of sweet pasta dough are fried and covered with sugar or honey. It takes on different names throughout central Europe including; chrusciki, krusczyk, frappe, frappole, sfrappole, flappe, cenci, crustci, donzelli, crostoli, galani in Veneto, lattughe, nastri delle suore, bugie, and gigi. No matter what you call them - they are addictive. Place the flour in mixing bowl with dough hook, add all ingredients except the confectioners sugar, and blend well at low speed, then mix for fifteen minutes. If kneading by hand, make a well in the center. Add the egg yolks and rub in with the fingers until combined Add all the other ingredients except the confectioner sugar. Blend well and keep kneading by repeating a pattern of folding the dough, flattening it, folding again, flattening it, for at least half an hour. Divide dough into four pieces and cover in plastic wrap. Allow to rest in the refrigerator for one hour or overnight. When ready to fry, roll out dough with a rolling stick 1/16th inch thick. Slice into 1 1/2-inch wide strips. Cut the strips diagonally preferably with a fluted pastry wheel into 5-inch lengths. In each strip, cut a one-inch slit the long way, in the middle of the strip. Pull one end of the strip through the slit so that it looks like a bowtie shape. Pre heat frying oil to 375F. test a small piece first, it should become golden in about 45 seconds, then turn over. Fry the strips in small batches until they turn light golden, turning once. Drain on wire screens and allow to cool. When cool, move to a serving platter and dust with confectioners sugar. Tip: The long mixing will create air pockets in dough; you will want the air pockets in the dough, to make the pastry puff when frying. I had an enjoyable afternoon tea with fellow Create TV host and Ireland’s TV chef, cookbook author Rachael Allen of Ballymaloe. Rachel and I exchanged our foodie stories and the like beginnings in our culinary careers. She shared with me her simplistic approach to food. I can't agree more. We agree that most are learning from this approach; getting back to the roots of growing and eating locally grown foods. The thing is, this in nothing new in Ireland, in fact they never lost their connection to sustainability. Chefs Rachael Allen and George Hirsch, Adair Manor, Adair Co. Limerick, Ireland However, one topic of discussion is as serious as rugby or politics. I asked just about every person I meet in Ireland which brand of tea they preferred better, Lyons or Barry's. Barry's seemed to hold the lead during our filming. But then upon departure at Irish Customs I was told I was bringing home the wrong brand. They preferred Lyons. I can't be swayed, Barry's fan here. 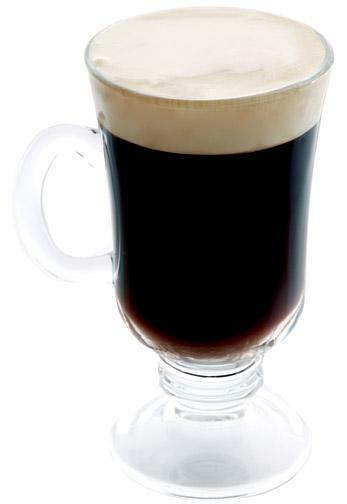 So in keeping peace let’s drink Irish Coffee, a warming beverage on a chilly evening. Served first to arriving passengers in County Limerick, what is now Shannon International Airport. Ideal served with a slice of Chocolate Torta from George Hirsch Lifestyle. Sláinte! Prepare a sugar-rimmed glass by rubbing a piece of lemon or orange around the rim of a large wine glass. Dip 1/4 inch of the rim of the glass into a plate of sugar, coating the edge. Place a teaspoon in glass. The spoon will diffuse the heat when hot coffee is poured into the glass. Add whiskey and Baileys. Pour coffee into glass over spoon. Remove spoon. Top with a dollop of whipped cream. 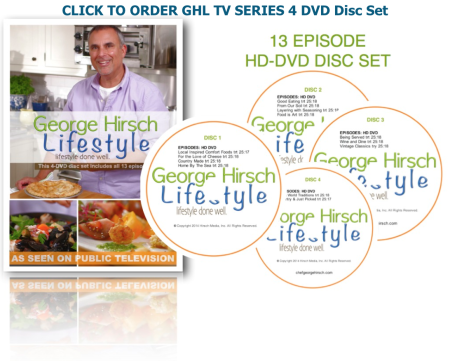 Having cooked outdoors with cedar plank on George Hirsch Lifestyle TV series and on many live TV shows, it's fool proof and quite impressive for entertaining; and as I say at the end of my show.."If I can do it You can do It!" Over the past twenty years I've intoduced the age old art of hot smoking on wood planks in my TV shows and cookbooks. However, this technique of cooking on planks is far from new. The Indians in the Pacific Northwest cooked on cedar and alder, a tradition done for many centuries, as all cooking on an open fire. Once you try it yourself you'll see why. Soak plank in water to cover 2 hours; drain. Pre heat Grill to high. Rub plank with one-tablespoon olive oil. Place fillets on plank; season with thyme, rosemary, paprika, black pepper, dill, lemon juice. Top with remaining olive oil. Grill 10-14 minutes on a covered grill for optimum smoke or until fish is cooked. The thickness of the fillets will determine final cooking time. Prior to serving top with fresh dill butter and serve with extra fresh lemon slices, or grill lemon slices along with salmon. *Soak planks for at least 2 hours or morein cold water before you fire-up the grill. Make sure the grill is good and hot, this is key! 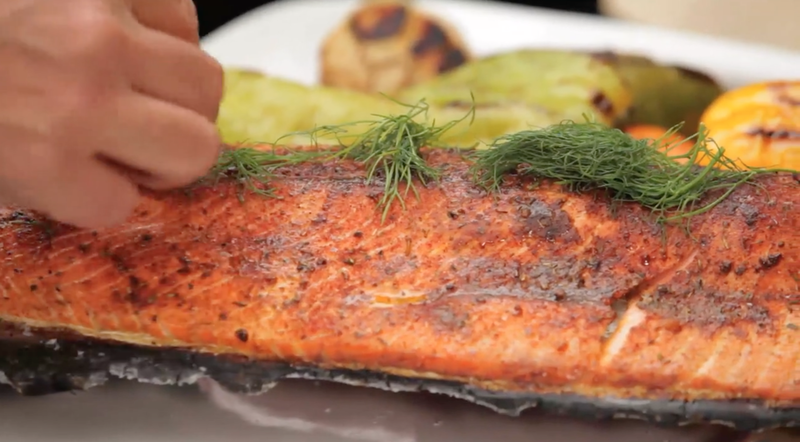 Grilled cedar planked fish takes on a wonderful smoky flavor. The plank will be charred, but the fish will be perfectly cooked. When opening grill if planks should fare up spray plank with water to dose flame and immdiatly close grill cover to reduce oxygen. Note: Cedar plank should be untreated non-resin wood, no thicker than 1 inch. A traditional Mexican dish from the pacific coast region of Jalisco; Posole is a thick soup made with hominy–dried corn with the hull and germ removed. Makes any large gathering a fiesta! Rub pork on all sides with Posole Pork Rub, and refrigerate for at least two 2 hours or overnight. Pre heat large soup pot to high heat. Brush chops with 2 Tablespoons olive oil. Add chops and sear pork on both sides until browned and not fully cooked. Add 1 Tablespoon olive oil, chopped onion, garlic, and cook for 2 minutes. Add the hot broth, jalapenos, hominy and simmer for 1 hour. Remove chops, cool and chop meat into small pieces. Put pork back into soup. Continue cooking for 30 additional minutes. The longer and slower the soup simmers the better. Stir in cilantro and serve bowls of soup topped with sliced radish, shredded cabbage, and with warm corn tortillas. Combine all ingredients in a small bowl and mix well. Store in a tightly sealed container. Entertaining a crowd during Gameday Season? Then, it's time to fire up that cooktop + start chopping. Those flavors will come together deliciously by gameday. This recipe has one bottle IPA beer; my personal taste favorite from my local micro-brew. I always advise, only use what you would drink! 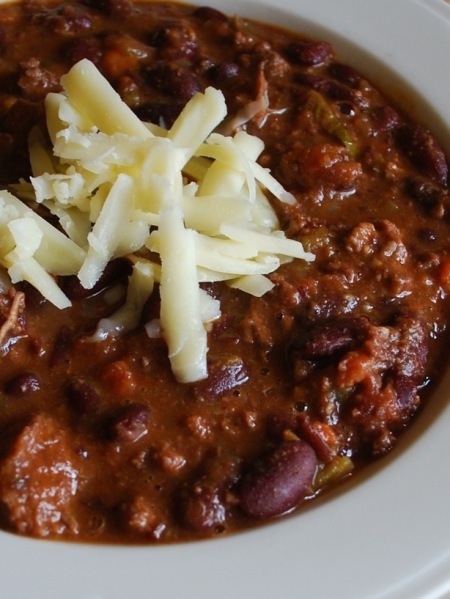 This basic chili recipe combines several flavors of the Southwest. Options: Turkey and pork can be substituted for beef and used in a combination for ultimate flavor. Make it vegetarian by using eggplant, squash, and extra onion in place of the meat. Pre heat a large soup pot over medium high heat. Add bacon and allow bacon to get a light golden color. Add garlic, onion, olive oil, scallions, jalapenos, serrano, and cook for 2-3 minutes stirring occasionally. Add beef and cook until becomes lightly browned. Drain off any excess fat. Season with cumin, oregano, basil, hot pepper flakes, and cinnamon. Add beer and reduce liquid for one minute, add tomatoes and vinegar. Lower temperature to a gentle simmer. Stir, cover pot and cook for 1 1/2 hours stirring occasionally. Add beans and cook for 30 minutes or until the meat is tender.